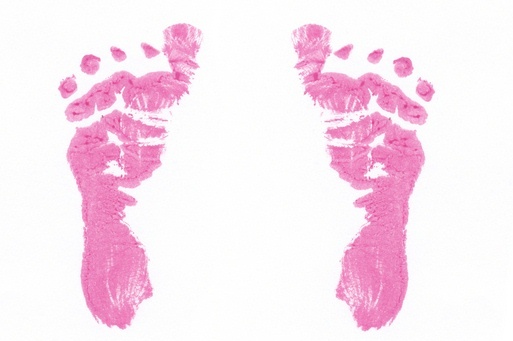 It's a Girl and we wanted to make these beautiful pink baby feet (imprint) invitations. We were then trying to somehow carry that theme to the shower but we are at a loss past buying Baby Feet cookie cutters and making cookies for the party. We've put together some great ideas to help you decorate and plan your baby shower. Enjoy! Use a footprint stamp and pink ink to stamp cute footprints on a white paper tablecloth. You can randomly stamp it, outline the border or have feet lead from one food item to another. Another alternative is to cut a footprint shape out of a sponge and stamp it in pink craft paint. Use pink streamers and pink balloons to decorate with. They make cute pink footprint balloons which would make a great accent! Make a sock rose bouquet for the centerpiece or use fresh pink flowers like roses, carnations or gerbera daisies. Sprinkle footprint confetti on the table. You could use a footprint paper puncher we found here. You can make your traditional baby shower favorite foods and not worry too much about the baby feet theme, since your table decorations cover this for you. Use footprint cookie cutters to bring life to your food table. A meat and cheese tray cut with a footprint cookie cutter. Footprint shaped sugar cookies. Foot print shaped sandwiches. How well do we know our feet? Give your guests the "All Things Foot Trivia" for a fun way to find out! mommies and time each of them separately on how quickly they can pair the socks up together. The one that does it in the shortest amount of time wins. Make this game harder by using different colors, textures, and designs on the socks. Select 2 to 3 bold guests to race to find a pacifier. The only catch is, they have to use their feet to do it! Set aside an area with a covering to protect your floor. Line up chairs for them to sit in. *This game might add a lot of color to your baby shower with squeals of delight and yes, disgust! The Love a baby brings. Then add, Thanks for coming to our shower! We did a "Ten Tiny Toes" shower for a friend of mine, and there are TONS of ways you can incorporate this into the details of the event. For example, we found a footprint cookie cutter (2 sizes) and used this for cheese slices (make them thick enough that they aren't flimsy) and made chocolates in a footprint mold to top cupcakes with. Everyone loved this; You can also use some items like socks, booties, etc. that Mom can use (socks are most practical! ), hang from a jute strand across the room, and have guests write down words of wisdom or funny memories of their own babies, roll them up (correlating scrapbook paper looks adorable for this), and place inside socks so they are sticking out. Mom can go through and read aloud or on her own, whichever fits the gathering best. Also, consider have the grandma(s)-to-be consider bringing the ink-footprints of Mom or Dad when they were born, if they have them, and display these near the gift table, etc., as a conversation piece. We used a lot of black/white photography of newborn toes as well (courtesy of a local photographer). Very very popular theme :) Good Luck! Everything is related to baby feet and It's a boy. It is blue and white. I even ordered little blue feet suckers. I have stand up brochures with baby feet poems on them. The invitations are movies on dvd that have pictures of mom, dad, belly shots, baby's room and ultrasound videos. There is also buggies on the decorations so I am using a buggy shaped watermelon to hold the fruit salad. Also bootie cups for the mint cups. This is the cutest and the best so far. I am so excited to be throwing this to my sister who is expecting twin boys. I love how I could just adjust a few things and it will be so great!